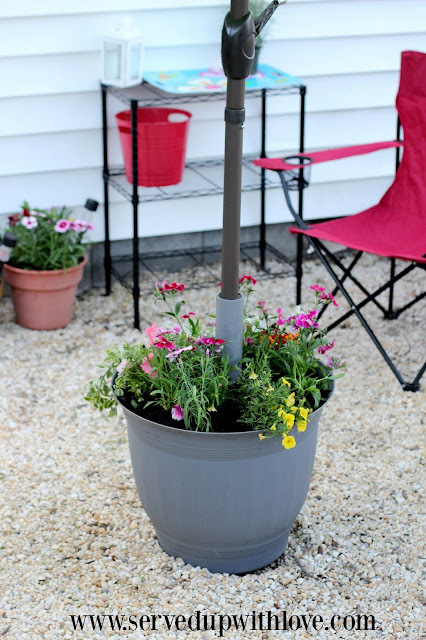 I'm bringing out my crafty side today and showing you how I made my new umbrella stand. We live in a rental house that is just a few houses down from my parents (and my sister) That means my kids are growing up in the same wonderful neighborhood that I did. That just makes my heart happy! We don't have a deck or a patio and the house is very small compared to most. The lady that used to live here before us had to have a handicap ramp put in. So that is the closest to a deck that I have. A couple of years ago we squared off a section next to the ramp and made a little patio area. I was never really happy with it but we made it work. My husband had shoulder surgery in April for a torn rotator cuff so we have been spending some time outside here and there to get a little break from looking at the same four walls. So I knew this year I needed to make a few changes so I would be happy with that area and enjoy it better. I had a market umbrella that we bought a few years ago and the umbrella stand that I had just wasn't tall enough to keep it from falling over and the tables that we had were no help either. So with the new changes I knew a new umbrella stand was a must. First I made sure that there were holes for drainage in the bottom of the pot. We then spray painted a 2 inch PVC pipe to match the pot that we bought from a local home improvement store. It was a perfect match! Then we added some rocks for drainage. Making sure to surround the PVC pipe in the middle. 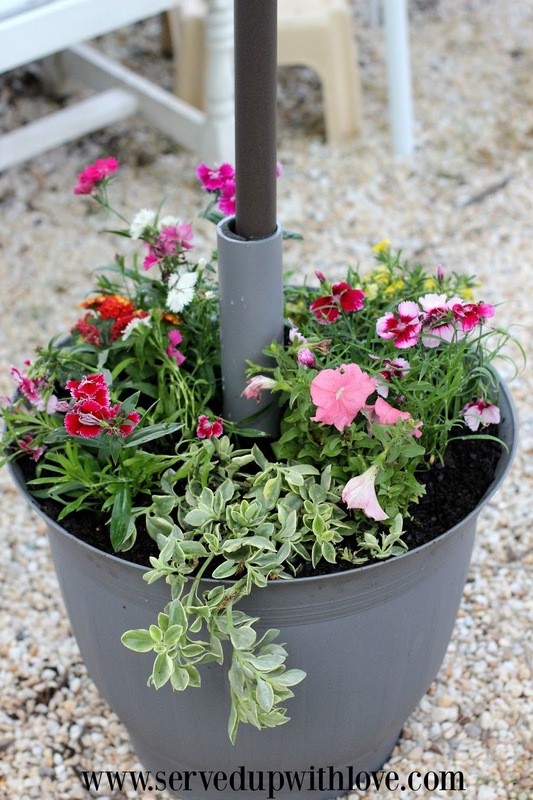 Now it was time to add the potting soil and the flowers. We added a few different varieties to give it some interest. As they grow they will fill out the pot and be pretty all summer. I am super happy with the way it turned out! The flowers are filling in nicely now and we have already had some guests over to enjoy it over Memorial Day weekend. Now I am on the hunt for a few more chairs though, our old ones have bit the dust! Oh and I just had to buy a new umbrella too! We just needed something bright, fresh, and new to liven up the space. 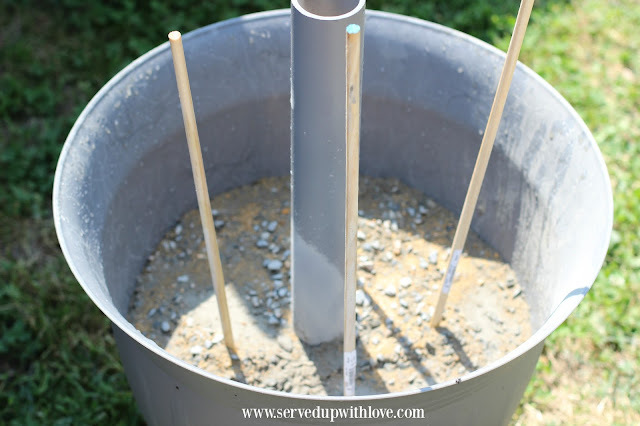 Spray paint the PVC pipe and allow to dry. 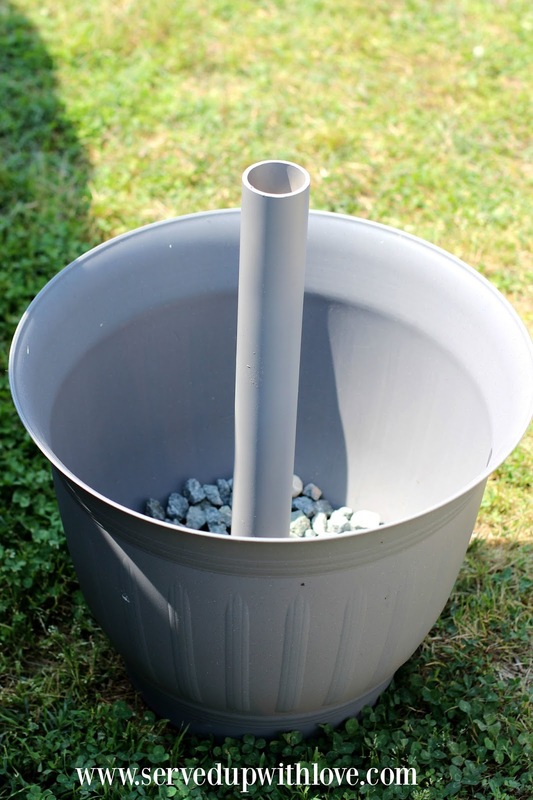 Place the PVC pipe in the middle of the pot and surround with rocks for support and allow drainage. Place dowels around using the rocks as support (you want them to be lower than the concrete to allow holes for drainage) Pour in the concrete and saturate with water. Remove dowels before the concrete hardens. 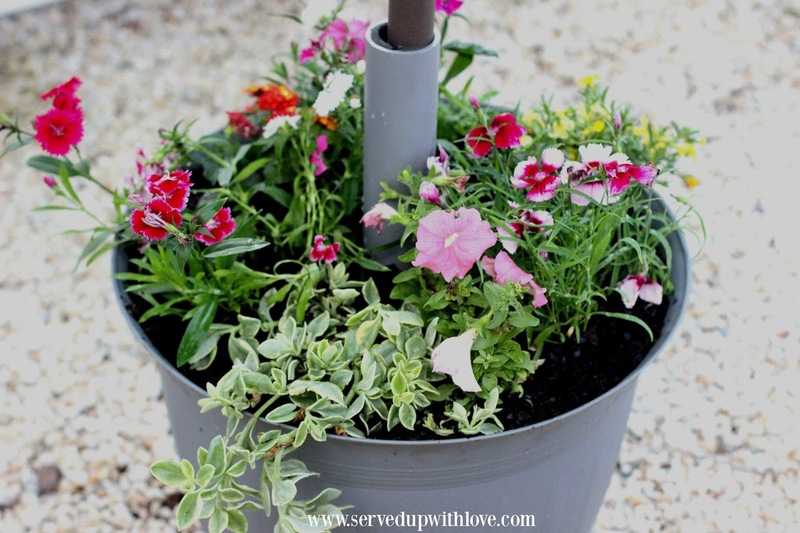 Once the concrete has hardened, add potting soil and top with flowers. Add your umbrella and kick back and enjoy!